Reposted & edited for new site: Alternative Thai News Network (ATNN). For an extreme in-depth look at Thailand's "Sufficiency Economy" and "New Theory" economics, please see, "Wisdom from the Orient: Self-Sufficiency." When thinking about "solutions" many are quick to cite organizing a protest and taking to the streets. Let's for a moment consider the mechanics of a protest, what it might accomplish, and what it may leave to be desired. Take Glenn Beck's disingenuous 2010 "Restoring Honor" event in Washington D.C. It drew thousands of honest, well-intentioned people from all over the United States. Indeed, thousands of people filled up their Fortune 500 made cars with gas from Fortune 500 oil companies, drove countless miles, stopping along the way at Fortune 500 fast food restaurants, stayed at Fortune 500 run hotels, and stocked up on supplies purchased at Fortune 500 Walmart. They slaked their thirst under the hot August sun with cans of Fortune 500 Pepsi and Coke, and at the end of the day, they drove home, paid their Fortune 500 cable subscriptions to watch their Fortune 500 media reports, most likely on News Corporation's Fox News, a Council on Foreign Relations corporate member. At best, all a protest will lead to, while we are so hopelessly dependent on this system, is a round of musical chairs inside the political arena, with perhaps superficial concessions made to the people. The vector sum however, will still be decidedly in favor of the global corporate-financier oligarchy. If we understand that the fundamental problem facing not only America, but the entire world, is a global corporate-financier oligarchy that has criminally consolidated their wealth by "liberalizing" their own activities while strangling ours through regulations, taxes, and laws, we should then understand why events like Beck's "Restoring Honor" are not only fruitless, but in fact, counterproductive. We should also realize that any activity we commit ourselves to must be directed at this corporate-financier oligarchy rather than the governments they have co-opted and positioned as buffers between themselves and the masses. While people understand something is wrong and recognize the necessity to do "something," figuring out what that "something" should be becomes incredibly difficult when so few understand how power really works and how to strip it away from the oligarchs that have criminally consolidated it. 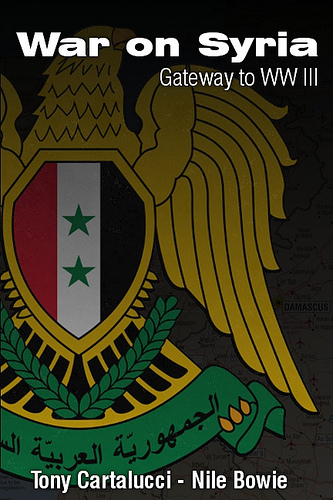 As of late, the expansion of this global oligarchical empire has taken a more extreme, perhaps desperate form involving staged revolutions as seen in Egypt and Tunisia, and in Libya's case, armed rebellion and foreign military intervention. However, worldwide coup d'etats have occurred before - for example, in the late 1990's under the guise of a "financial collapse" and IMF "restructuring." Many nations fell beholden to the IMF and its regiment of "reforms" which amounted to neo-colonialism packaged under the euphemism of "economic liberalization." To illustrate how this works, it may help to understand what real colonialism looked like. 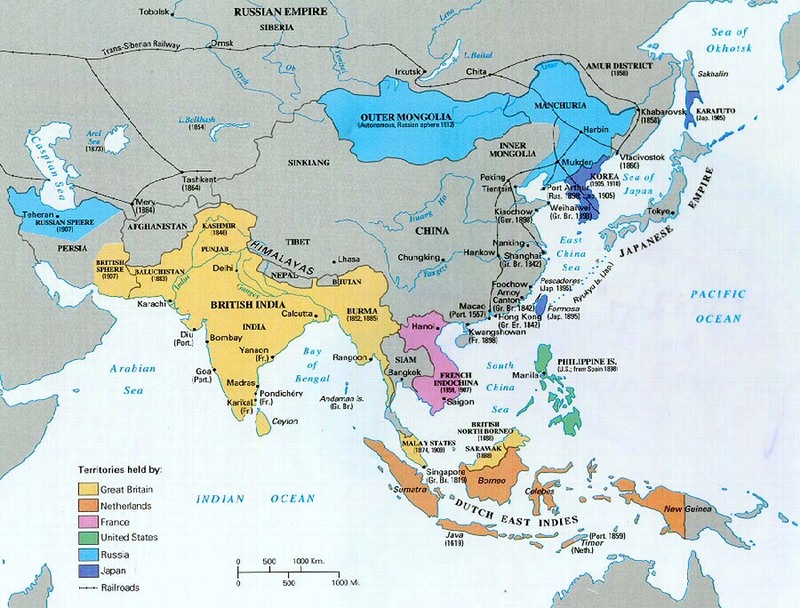 Image: Thailand's geopolitical surroundings 1800-1900. Thailand was the only Southeast Asian country to avoid European colonization. Thailand in the 1800's, then the Kingdom of Siam, was surrounded on all sides by colonized nations and in turn was made to concede to the British 1855 Bowring Treaty. See how many of these "gunboat policy" imposed concessions sound like today's "economic liberalization:"
A more contemporary example for comparison would be the outright military conquest of Iraq and Paul Bremer's (CFR) economic reformation. The Economist gleefully enumerates the neo-colonial "economic liberalization" of Iraq in a piece titled "Let's all go to the yard sale: If it all works out, Iraq will be a capitalist's dream:"
And few could argue that the IMF's rehabilitation regiments being forced upon nations all over the world after the late 90's financial crash are any different than economic colonialism both past and present. In fact, the IMF itself publishes reports at great length concerning the "necessity" of economic liberalization. To be sure, the governments that come to power in the wake of the current Middle East destabilizations will be more servile and will undoubtedly be committed to similar economic liberalization. Brookings Institute's Kenneth Pollack already made it quite clear that "The struggle in the new Middle East must be defined as one between nations that are moving in the right direction and nations that are not; between those that are embracing economic liberalization, educational reform, democracy, the rule of law and civil liberties, and those that are not." Siam eventually rolled back the terms of the 1855 Bowring Treaty as the British Empire waned, but as of 1997, Thailand was once again faced with similar terms, dictated this time by the bankers of the IMF. Thailand's answer to the IMF, and globalization in general was profound in both implications as well as in its understanding of globalization's end game. Fiercely independent and nationalistic, and being the only nation in Southeast Asia to avoid colonization, Thailand's sovereignty has been protected for over 800 years by its revered monarchy. The current dynasty, the House of Chakri, has reigned nearly as long as America has existed as a nation and the current king is regarded as the equivalent of a living "Founding Father." And just as it has for 800 years, the Thai Monarchy today provides the most provocative and meaningful answer to the threats facing the Kingdom. The answer of course is self-sufficiency. Self-sufficiency as a nation, as a province, as a community and as a household. This concept is enshrined in the Thai King's "New Theory" or "self-sufficiency economy" and mirrors similar efforts found throughout the world to break the back of the oppression and exploitation that results from dependence on an interdependent globalized system. The foundation of the self-sufficiency economy is simply growing your own garden and providing yourself with your own food. This is portrayed on the back right-hand side of every 1,000 baht Thai banknote as a picture of a woman tending her garden. The next step is producing surplus that can be traded for income, which in turn can be used to purchase technology to further enhance your ability to sustain yourself and improve your life-style. The New Theory aims at preserving traditional agrarian values in the hands of the people. It also aims at preventing a migration from the countryside into the cities. Preventing such migrations would prevent big agricultural cartels from moving in, swallowing up farming land, corrupting and even jeopardizing entire national food supplies (see Monsanto). Those familiar with the UN's Agenda 21, and the more recent UN "Climate Change Program," may understand the deeper implications and dangers of such a migration and why it needs to be stopped. By moving to the city, people give up private property, cease pursuing productive occupations, and end up being folded into a consumerist paradigm. Within such a paradigm, problems like overpopulation, pollution, crime, and economic crises can only be handled by a centralized government and generally yield political solutions such as quotas, taxes, micromanagement, and regulations rather than meaningful technical solutions. Also, such problems inevitably lead to a centralized government increasing its own power, always at the expense of the people and their freedom. The effects of economic catastrophe are also greater in a centralized, interdependent society, where everyone is subject to the overall health of the economy for even simple necessities like food, water, and electricity. 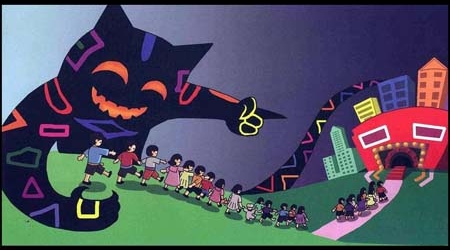 Image: A slide presenting the "New Theory" depicting a manifestation of greed leading the people from their rural private property and into a "city of extravagance." 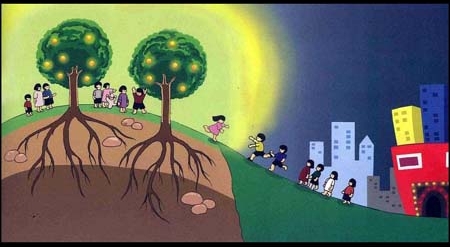 If Agenda 21 had an illustrated cover, this could be it. 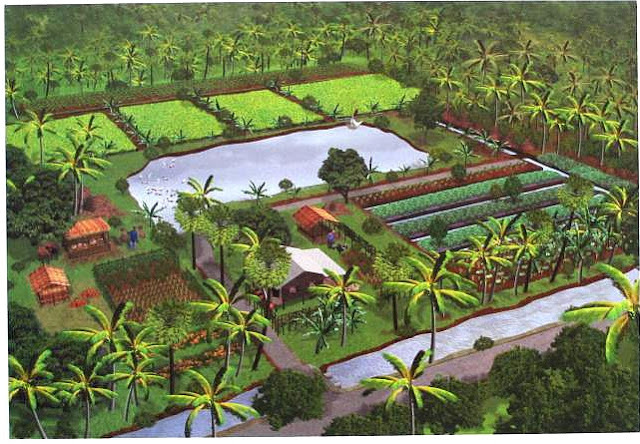 Image: The goal of the "New Theory" is to have people return to the countryside from the cities and develop their communities in a self-reliant manner. It is, in other words, Agenda 21 in reverse. Under the "New Theory," demonstration stations all across Thailand have been created promoting education in matters of agriculture and self-sufficient living. The program is competing against the contemporary globalization system, which as of now, is mired in many parts of the world with economic meltdown. The relatively self-sufficient nature of Thais in general has weathered this economic chaos fairly well. In 10 years, a plate of food still costs the same amount of money, as do many everyday commodities. This only further vindicates the value of being self-sufficient and now more than ever, in both Thailand, and abroad, it is a good time to get involved and get self-sufficient. Of course the head-of-state of a nation almost 70 million strong promoting a lifestyle that cuts the legs out from under the Western corporate-financier agenda does not sit well with the oligarchical establishment. Their response to this, as it has been with all of Thailand's habitual displays of defiance is something to behold. Perhaps the most vocal Western corporate-financier critic of Thailand is the Economist. It openly criticizes the King's self-sufficiency economy in an article titled "Rebranding Thaksinomics." It states that the economic plan is "a partial retreat from Thailand's hitherto liberal economic stance." The Economist muddles the debate by side-stepping the self-sufficient aspects of the"self-sufficiency economy." It claims that socialist handouts under deposed Prime Minister and documented Western proxy Thaksin Shinawatra somehow accomplished the exact same goals. The Economist also claims the concept of self-sufficiency is merely a "rebranding" of such socialist handouts. The Economist article then breaks down into a pro-Thaksin rant, decrying his ousting from power and continued claims that somehow encouraging people to grow their own food is a theft of Thaksin's socialist/populist policies. It should be noted that permanent socialism is not self-sufficiency. It is complete dependency on the state and on people who pay their ever increasing taxes. Socialism is not about growing your own garden, using technology to enhance your independence or solving your problems with your own resources. It is about taking from the collective storehouses of the state, and when you are again hungry, taking again. Socialism could only be very useful as a stop-gap measure between current problems and the active pursuit of permanent technical solutions. However, the goal of globalization is to create interdependency between states, and total dependency on global institutions, therefore, perpetuating problems, not solving them becomes the equation. Another Western pro-corporate-financier point-of-view comes from Australia's National University's "New Mandala" blog written by academic wonk Andrew Walker. The blog itself is a clearinghouse for corporate subsidized talking points regarding Southeast Asia and is tied to the corporate-financier funded Lowy Institute. Some "contributing writers" even include Thaksin Shinawatra's hired lobbyist, Robert Amsterdam. Walker's entire perception of Thailand seems to be derived from his time spent in a single village in Northern Thailand. From his myopic point-of-view in the minute village of "Baan Tian," he condemns entirely Thailand's self-sufficiency economy in his article "Royal misrepresentation of rural livelihoods." He suggests that "the sufficiency economy prescriptions for rural development are inappropriate and disempowering." As with the Economist, the article breaks down into a pro-Thaksin rant claiming the entire plan is meant to keep the rural population of Thailand in their place, out of the cities, and thus out of the debate of national issues. Of course, becoming self-sufficient is one step on the road to real empowerment. Academic wonks like Andrew Walker presume the height of empowerment is feeding a paper voting stub into a box, on your way home from a service sector job, and then relaxing behind the glow of a new plasma screen TV bought on credit. A more likely argument would be that sustaining your own existence, wrought from the land beneath your feet, and the ability to shape the world around you with an understanding of science and the mastery of multiple trades is the height of empowerment and the truest form of human freedom. The hand wringing within the writings of the Economist and ANU's Andrew Walker is not the full extent of the West's reaction to Thailand and its wandering from foreign dominion. A full fledged "red" color revolution has been brewing within the Kingdom since at least 2009. Reading the "Red Siam Manifesto" penned by "red shirt" intelligentsia Giles Ungpakorn makes it quite clear how they view "self-sufficiency" and the need to "reform" Thailand as a "socialist welfare state." Ungpakorn's childish and ranting manifesto can be found on "Socialist Worker Online" here. A complete selection of the "red shirt" propaganda used within Thailand can be found here. 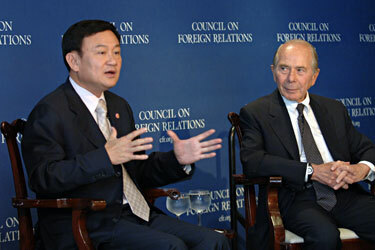 In 2004, Thaksin attempted to ramrod through a US-Thailand Free-Trade Agreement (FTA) without parliamentary approval, backed by the US-ASEAN Business Council who just before last year's 2011elections that saw Thaksin's sister Yingluck Shinawatra brought into power, hosted the leaders of Thaksin’s "red shirt" personality cult. Thaksin would remain in office from 2001 until September of 2006. On the eve of the military coup that ousted him from power, Thaksin was literally standing before the Fortune 500-funded Council on Foreign Relations giving a progress report in New York City. To say that Thaksin Shinawatra and his "red shirts" have foreign backing would be a profound understatement. Thaksin's proxy political party maintains the "red shirt" mobs which in turn are supported by several NGOs including the National Endowment for Democracy funded "Prachatai," an "independent media organization" that coordinates the "red shirt" propaganda efforts. Prachatai was recently nominated for the Deutsche Welle Blog Awards by the "Neo-Con" infested Freedom House, upon which former Thaksin lobbyist Kenneth Adelman sits as a member on the board of directors. Image: US Neo-Conservative, corporate-financier run Freedom House "tweets" their March 11, 2011 nomination of NEDfunded "red shirt" propaganda clearinghouse, Prachatai.com. Western corporate-financier interests know what's going on already and they are moving against it while the majority of humanity still sleeps in ignorance and apathy. Thailand is but one nation of many, in China's "String of Pearls" that is targeted for destabilization and US State Department sponsored "liberation." The key to stopping these foreign interests dead in their tracks is seizing back from them the mechanisms of civilization - and we have done that already in terms of the alternative media. Such success is necessary in all aspects of our life, and as the King in Thailand suggests, it can start with something as simple as growing your own garden. Of course in Thailand, agricultural self-sufficiency is coupled with technology to enhance efficiency and improve the quality of life. Even in the city, small independent businesses are adopting the latest technology to improve their production, increase their profits, and even out-compete larger corporations. Computer controlled machining equipment can be found in small workshops crammed into old shop-houses, automatic embroidering machines allow a single woman to fulfill orders for name tags on new school uniforms - rather than both businesses sending off orders to factories owned by a handful of wealthy investors. A multitude of examples can be seen walking around any city block in Thailand's capital of Bangkok. Image: MIT's Dr. Neil Gershenfeld inside his "Fab Lab," arguably the birthplace of the personal fabrication revolution. Bringing this sort of technology to rural people, even enabling people to create their own technology rather than just employ it, is not just science fiction but is a reality of today. MIT Professor Dr. Neil Gershenfeld has developed the "fabrication laboratory" or "Fab Lab." The Fab Lab is a microfactory that can "make almost anything." His Fab Lab has since been replicated all over the world in what he calls the personal fabrication revolution. It aims at turning a world of dependent consumers into independent designers and producers. 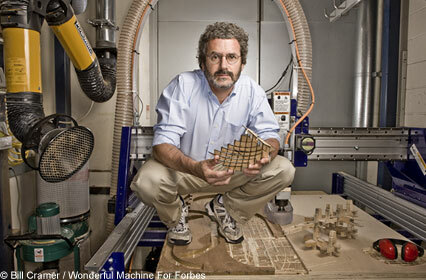 Video: Dr. Neil Gershenfeld presents his Fab Lab at TED. Dr. Gershenfeld in his own words articulates the problem of finding support amongst institutions and governments, stating that individuals are very enthusiastic about this revolution "but it breaks their organizational boundaries. In fact it is illegal for them, in many cases, to equip ordinary people to create rather than consume technology." This indeed not only encapsulates Dr. Gershenfeld's dilemma, but describes to a "t" the mentality of oligarchs and the fears they harbor about empowering the people, a fear reflected in the "organizational boundaries" of their corporations and governmental institutions. This is a feature of oligarchy described as early as 300 B.C. in ancient Greece in "The Athenian Constitution." In it, a character referred to as "the Old Oligarch" describes his contempt for the social mobility the technology of the Athenian navy affords the lower echelons of Athenian society. Dr. Gershenfeld goes on to encapsulate the true potential of his Fab Labs by stating, "the other 5 billion people on the planet aren't just technical "sinks," they are "sources." The real opportunity is to harness the inventive power of the world to locally design and produce solutions to local problems." Dr. Gershenfeld concludes by conceding he thought such a possibility was 20 years off, but "it's where we are today," noting the success his Fab Labs are already having around the world. 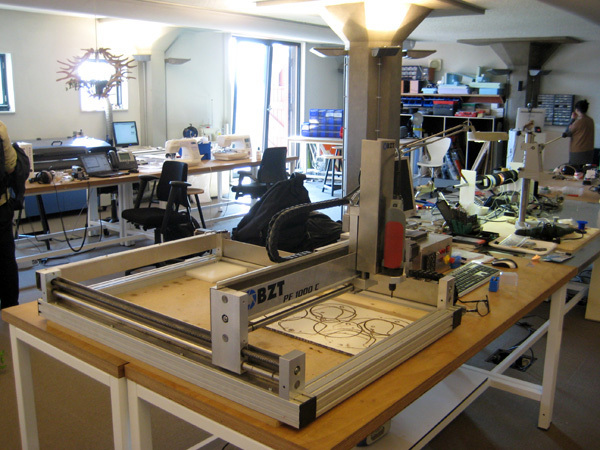 Image: The interior of a "Fab Lab" in Amsterdam, featuring a array of personal manufacturing technology. Dr. Gershenfeld's message resonates with the current culture of Thailand and the ambitions of the "self-sufficiency economy." In many ways, Thailand's patchwork of micro-businesses, already successfully by-passing capital intensive centralized production, vindicates the work and optimism of Dr. Gershenfeld. It also, however, resonates strongly with the self-reliant traditions that had made America great. The technical possibility for this to change the world is already a reality, but Dr. Gershenfeld himself concedes that the biggest obstacle is overcoming social engineering - in other words - creating a paradigm shift in the minds of the population to meet the technical paradigm shift that has already taken place. Self-sufficiency and the harnessing of technology in the hands of the people are the greatest fears of the corporate-financier oligarchy - fears that oligarchs throughout the centuries have harbored. Simply boycotting multinational corporations and replacing them with local solutions is something everyone can afford to do starting today. And by simply looking into Dr. Neil Gershenfeld's "Fab Lab," similar ideas such as "hackerspaces," raising awareness of the personal fabrication revolution, and even in the smallest way participating can help overcome the obstacle of social-engineering and spur a profound paradigm shift. We have begun to seize back the media, now it is time to seize back the other levers of power. Now is the time to recognize true freedom as being self-sufficient as a nation, as a community, and as a household, and start living it everyday.